Now revised, expanded and updated, "Lore of Running" gives you incomparable detail on physiology, training, racing, injuries, world-class athletes, and races. Author Tim Noakes blends the expertise of a physician and research scientist with the passion of a dedicated runner to answer the most pressing questions for those who are serious about the sport for example, how your body systems respond to training, the effects of different training methods, how to detect and avoid overtraining, and genetic versus trainable potential. How to train for the 10K up through ultramarathon with detailed programs from Noakes and several leading running experts and how to prevent and treat injuries, increase your strength and flexibility, and use proper nutrition for weight control and maximum performance details are also included. You'll also find a candid analysis of supplements and ergogenic effects and training aids. The book includes new interviews with 10 world-class runners who share their secrets to success and longevity in the sport. It features on legendary figures and events in running history provide fascinating insights. And that's just scratching the surface. 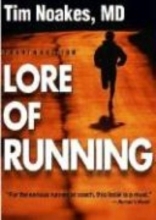 "Lore of Running" is not only the biggest and best running publication on the planet. It's the one book every runner should own.